Engaging Children in Prayer: Make a personalized prayer book! When my first child was young I had made her a book of photos of the family. She loved looking at the photo book and it would keep her busy for quite awhile. I haven’t gotten around to making an updated one until this week. I was inspired by other blogs that I saw online where they had photos of people that they pray for on poster board. I thought it would be neat to make my kids their own prayer books. Whenever we get to the part of our prayers where the kids name our family members, they always seem to get distracted. Having a visual like this helps children focus and think about the people they are praying for, rather than reciting a list of names. Use this prayer book every night when you pray for others. When you go to Liturgy, bring it with you, so that children can connect their prayers at home to prayers at church. It also helps children learn that they should be praying during Liturgy and not thinking about other things. 🙂 Having a book like this is also great for children who live far away from their relatives. They will be better able to recognize and remember names of people from seeing their photos everyday. 1. Roller glue dots found in the scrapbooking section. It will help keep your photos in the center of the page if your photo is not an exact 4×6 size. 2. Clear packing tape or clear contact paper to seal the tops of the pages so little ones won’t take the photos out! Print out photos of people you want to pray for. Make sure the photos are up-close, clear and that the background is not distracting. For the first page, I glued an icon on a notecard. I added this because I wanted my children to know that this is a prayer book and not just a photo album. It also helps them set their minds on God and gets them ready for prayer. A lot of my photos were not exactly 4×6 or I had to cut someone out so it was only a specific person featured on the page. If you have to do this you will want to use roller glue dots to secure the photo in the center of a piece of notecard. 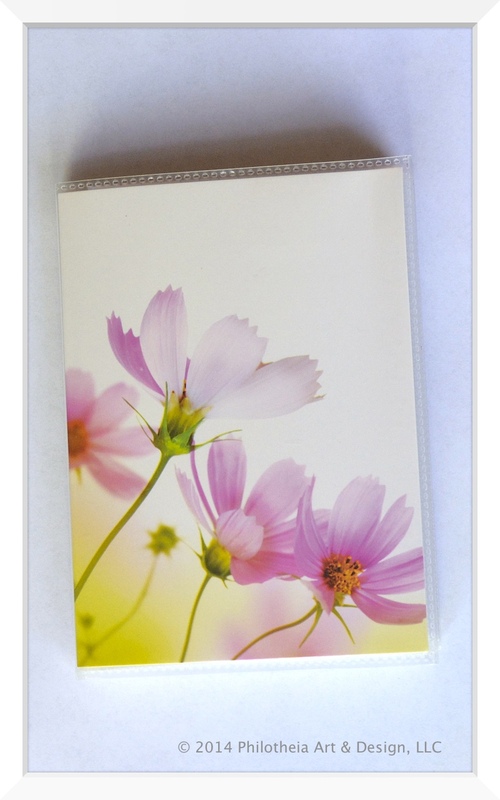 If your photo does not need secured, you can just slide the photo in with another piece of notecard. Press down the photo to secure it to the notecard. Slide the photo in along with an extra piece of notecard to make the pages thicker and easier for little ones to turn the page. Being a teacher, I printed out the text for each person’s name to help my kids learn to recognize names in print. It is important for children to learn that print has meaning even at a young age. Once children begin to recognize their own names, they will be interested in learning to spell other’s names as well! For the text, you can print directly to the notecards, if you can figure that out! 🙂 My printer doesn’t like special sized papers so I printed them out on 8.5 x 11 paper. I used Microsoft Word to create a table that was 1 column by 1 row wide. I used the rulers on the top and sides as my guide to set the box at 4×6 inches. Then I thickened the border to make cutting easier. To do that you click on Format->borders & shading and then change the line width in the drop down box. It worked great! I also like to tape the top shut, otherwise the children may try to take the photos out. Clear packing tape works great or you could use clear contact paper. It’s hard to see it in the picture but I’m securing the top of the page with packing tape. On the cover, put the child’s name and maybe even their photo, so they know it is their special prayer book. For older children, you may want to have a section in the back of the book where they can write names of people that need special prayers on pieces of paper and put them in one of the photo slots. Did you make a prayer book? Let us know how it went! I hope that this book helps your child engage in prayer. Posted in Activities, Teaching Kids and tagged engage children in prayer, family, prayer, prayer book, praying on November 8, 2014 by Kristina. ← What Do You See at Liturgy – Now Available!! !